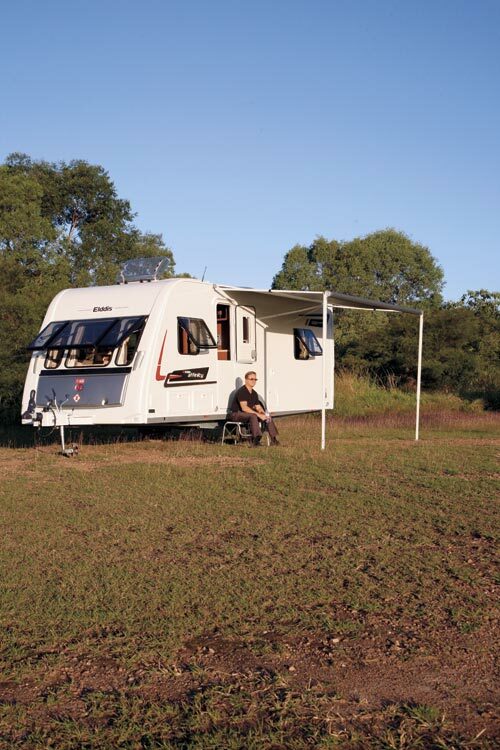 Another range of caravans imported from Britain has arrived in Australia, in what seems to be a rising trend. 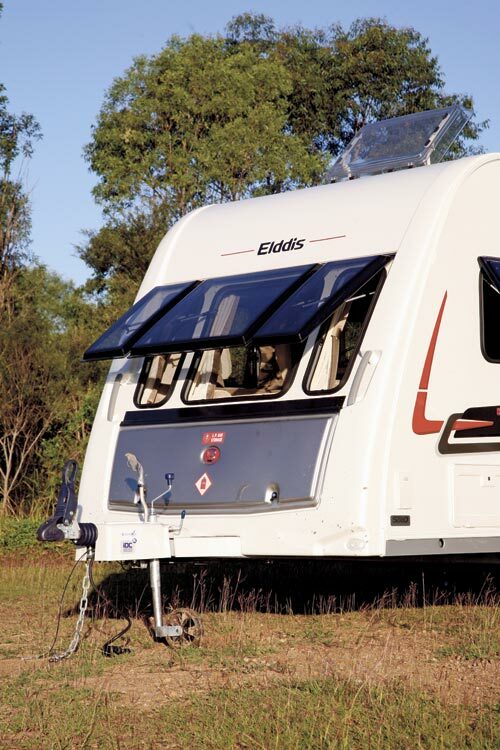 Elddis is a large British manufacturer and has appointed south-east Queensland’s Elite RV as its official distributor. 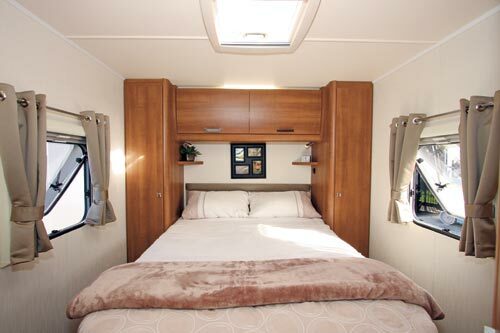 Elite’s managing director, Darren Nye, said for practical and, in some cases, compliance reasons, the company won’t bring over the entire Elddis range but there are enough models to give customers a good choice. One of the first models to arrive in Australia and be made fully compliant is the Affinity 550. It’s a single-axle 6.27m (21ft 7in) van with a Tare of 1350kg and an ATM of 1800kg. 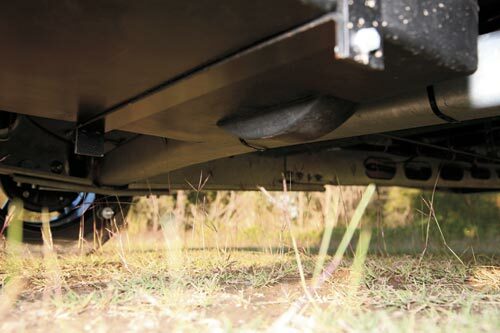 That gives it a good payload of 450kg (often single-axle vans are less) and also makes it suitable for a considerable number of tow vehicles. Elddis calls its vans’ body construction ‘Solid Construction’. It is basically a composite panel developed by a company called Henkel (not Heinkel, the aircraft manufacturer). Henkel is a German manufacturer that handles bonded construction for boats, yachts and planes where both strength and light weight are prime concerns. 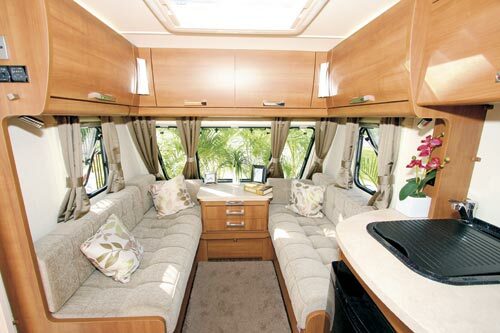 Elddis clearly has faith in its body design – it offers a 10-year manufacturer’s warranty. The Affinity has a raked appearance from the front and looks quite square from the back. Large double-glazed and tinted Euro-style windows are fitted all round, along with a split entry door. In addition to the front boot, which houses the two 9kg gas cylinders, there’s a second external bin at the front nearside. This bin is actually the storage area under the lounge seat and part of it is taken up by the deep-cycle battery. The awning only just covers the entry door because of the front window and the bin door, and it’s probably not going to keep out wind-driven rain. The Affinity’s front lounge/dining area, with its two sideways-facing lounges, is very inviting, and makes you want sit down and relax immediately. 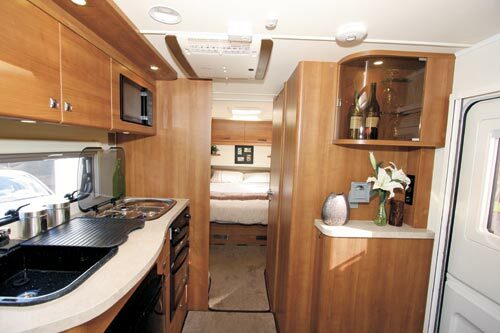 This van also has an island bed in the rear, which leaves room in the mid-section for the kitchen and bathroom. Not surprisingly, the Affinity’s general cabinetry has a European look about it – the mixture of curves and right-angles are an interesting combination, while features such as the wine bottle and glass cabinet by the entry door add a touch of class. The darker hues of the timber finish are, by day, offset by light from the large windows and the two roof hatches fore and aft. At night, the LED lighting kicks in. It’s an interesting selection of reading lights, corner fittings and ceiling downlights which combine to create an effective level of practical mood lighting. The kitchen takes up quite a small space, compared to the lounge and bedroom. The bench is just large enough for a four-burner cooktop (three gas, one electric) and a sink with a detachable drainer, but not much else. Under the bench are the Thetford 113L three-way fridge below the sink and the grill/oven below the cooktop. That leaves enough room for a small drawer and cupboard in the middle, and a floor locker. The microwave is located in an overhead locker above the kitchen bench. The kitchen has everything you need but it’s probably more suitable for travellers who cook simple meals with minimal preparation rather than cordon bleu chefs. The front lounges of British and European vans are often multifunctional, and this is a feature I really like. This one is no different. In its main role, it will seat two with their feet up or, if guests come calling, four people can sit without too much trouble. The cabinet between the lounges can be easily extended to make up a small table. Finally, if guests want to stay for the night, a slatted wooden base can be drawn out from the bottom of the central cabinet and the seat backs used to make up a very large bed measuring 2.04x1.5m (6ft 7in x 5ft). The main bed (1.87x1.35m/6ft 2in x 4ft 5in) in the rear is a fixed island bed that doesn’t need to be made up at night. The bedhead is a bit different to the norm – it has full-height wardrobes on either side with overhead lockers in between. There are two small bedside shelves set high enough to be out of the way but they are a bit awkward to reach. I thought recessed compartments in the wardrobe, situated lower down, might be more useful. 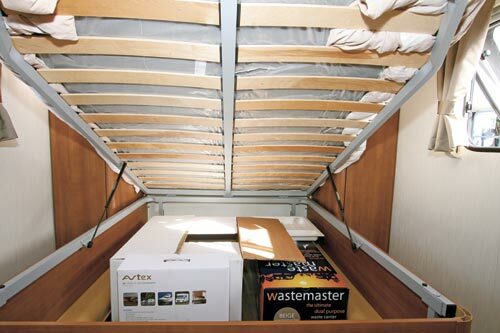 The corner cupboards at the foot of the bed are useful but they make getting around the bed a bit awkward. As is often the case in this style of layout, the bathroom is split with the circular shower cubicle on the offside and the toilet and washbasin cubicle opposite. 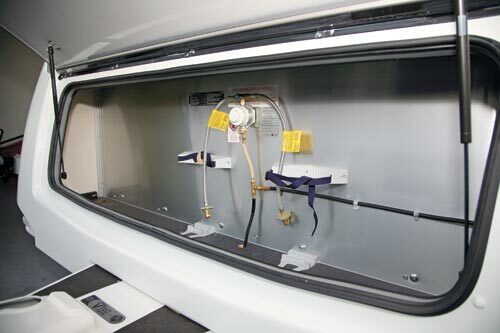 The door for the latter can be used to close off the front half of the caravan from the rear. 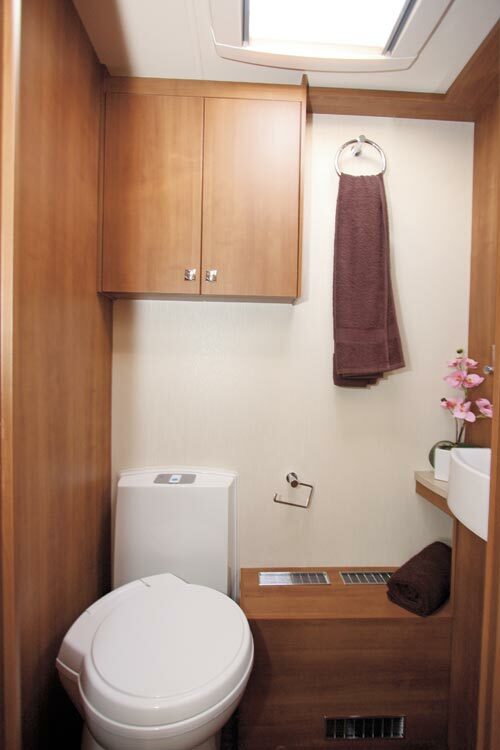 The toilet cubicle is a generous size and includes all the normal features such as a cassette toilet, washbasin and towel rails. It also comes with a large skylight and space heater outlet. 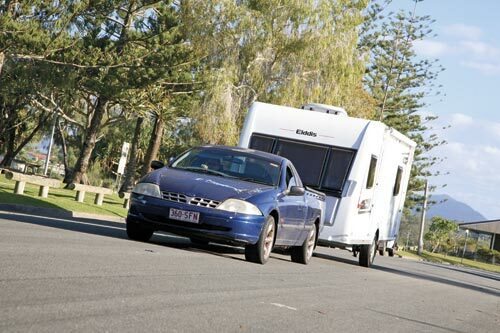 On the road, the Affinity was a very well-behaved tourer behind our Ford Falcon tow vehicle – even when the tow vehicle became bogged while traversing some very soft terrain. Given the light weight of the van, recovery was very easy. We simply unhitched and manhandled it around in order to get the tow vehicle out! 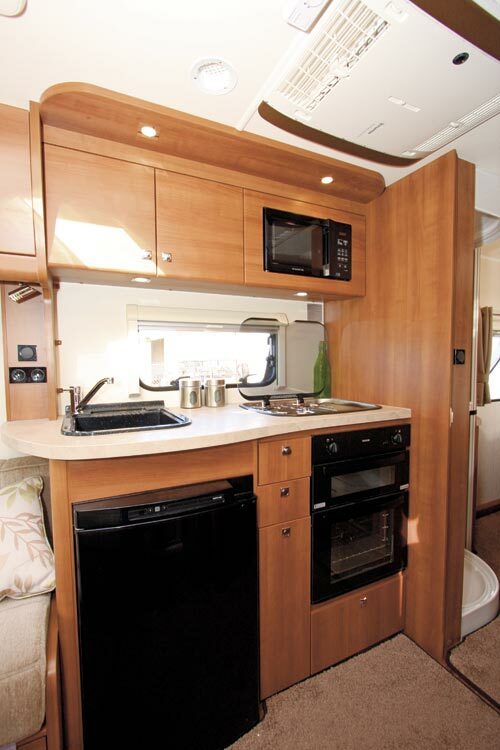 One of the most attractive features of the Elddis Affinity is its weight, or lack thereof. 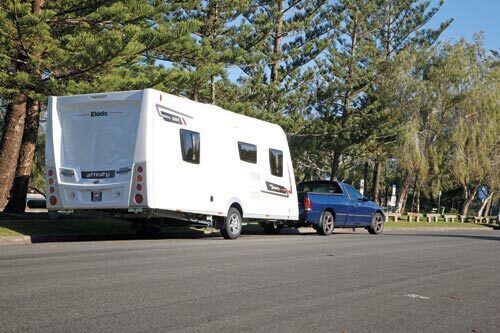 The single axle, instead of a tandem axle, which is more usual for a caravan of this length, is a surprise, but it doesn’t seem to affect the towing side of things. The island bed is a boon for those who don’t like corner or east-west beds. This, together with the large lounge, means there’s a price to pay in the form of a relatively small kitchen. But if that’s okay with the catering staff, then the Affinity is going to be a bit of a winner. Originally published in Caravan World #519, October / November 2013.